Minerva Bunker Gear Cleaners is committed to providing the firefighting community with the finest possible maintenance care program available. We have the largest facility in the country dedicated exclusively to the cleaning, repair and inspection of Bunker Gear and Turnout Gear (PPE’s) as well as Wildland, Industrial and Aviation Fire Fighting Ensembles, Fire Fighting Ensembles (FFE’s), Fire Protective Garments (FPG’s) for shipboard personnel and Proximity Suits. We are fully NFPA 1851 Compliant and verified by Intertek, a leading third party verification service. Minerva Bunker Gear Cleaners is recognized by all of the major manufacturers and is authorized to do extensive repairs and alterations. We utilize the APT tracking system which allows your department to monitor the condition of your gear so that you are better able to manage your inventory and budget. Minerva Bunker Gear Cleaners prides itself in offering superior service at an extremely fair price. We have the fastest turn-around time in the industry and we offer free shipping both ways to your department. 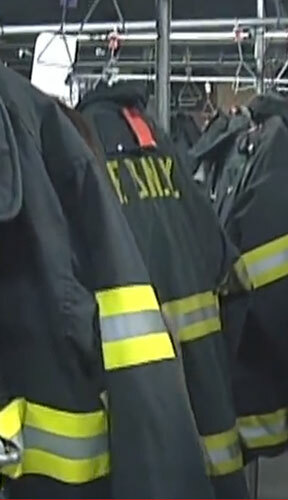 Minerva Bunker Gear Cleaners services hundreds of departments nationwide from small volunteer departments to large metropolitan departments such as the F.D.N.Y.. We know the needs of fire departments and are committed to delivering the best service possible.